Today’s paper doll is a new addition to the 1920s Children’s Wardrobe Collection. My love of 1920s fashion is pretty well documented on the blog, just check out the 1920s tag. So, for the last year, I’ve been drawing a lot of 1920s children’s clothing. The late 1920s to the early 1930s are perhaps my favorite era in the 20th century. None of the looks would look decent on me, but I adore them. 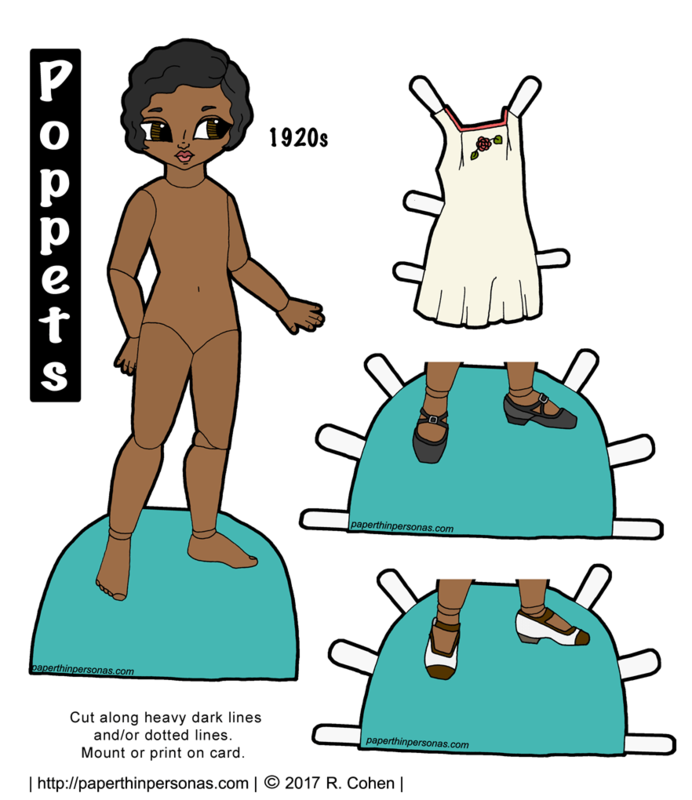 So far, I’ve drawn 5 dresses for the Poppet’s paper dolls 1920s Children’s Wardrobe Collection. It seemed high time that I added another new doll to the project. So, now my Louise Brooks clone paper doll has a friend. 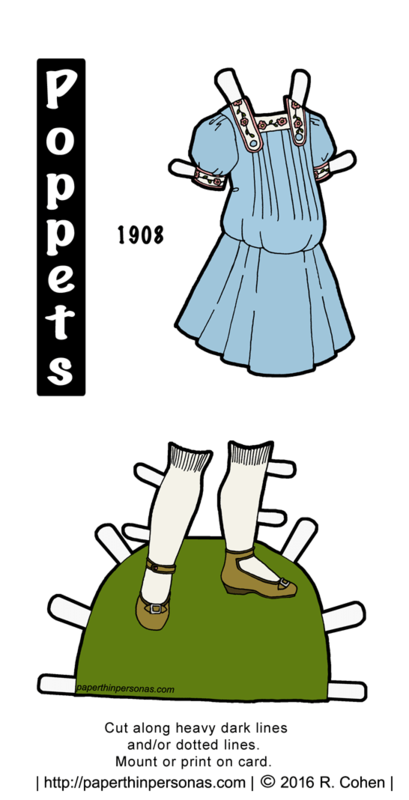 Along with her shoes, today’s Poppet paper doll to print has a pair of combinations based on several different sets I’ve seen. I drew her so long ago, that I confess I’m not certain about my sources. So, this may be a 1920s experience in feel, more than a precise act of historical research. Anyway, I super hope you enjoy her and I really think she’d pretty cute. I’ve got a few more 1920s pieces drawn before I need to work on more. And there will be more. Need a some clothing for today’s Poppet paper doll? Pick Out Some Clothing Here. It also felt a little odd to only have on Asian Poppet paper doll when you consider that they are all based on Ball Jointed Dolls from Asia, which also rarely look Asian, now that I mention it. I’ve always wondered why… but I digress. Today’s paper doll has the same skin-tone as Posey from 2014, so they can share shoes. Poor Posey hasn’t had any sandals for the last 3 years. You have to feel a little for her, you know? I went back and forth a bit about clothing options before I settled on a simple knit dress. The dress went through about six different color combinations, I confess. For what is a pretty simple paper doll, this doll gave me some trouble. Love her? Hate her? Wish they made that dress in your size? Let me know in a comment. So, with all the 1920s paper doll clothing I have been drawing lately, it seemed dumb not to have a 1920s Poppet paper doll to wear it. This is the first of what I hope will end up being two or three 1920s Poppet dolls, but for now I am calling one a victory. I am also a huge Miss Fisher Murder Mysteries on PBS fan and it seemed to me that the best 1920s doll would be one with Phryne Fisher’s coloring which means dark hair and pale skin. This was very fashionable look for women of the 1920s thanks to the movie star Louise Brooks. The paper dolls hair is based on Louise Brooks. I gave our 1920s paper doll a period slip with attached drawers and lace accents. I also wanted to give her two pairs of shoes to wear with any of the 1920s collection dresses or any of the other Poppet clothing. She has the same skintone as Poppy, Paradisea and my Vintage 1950s one. Her side-glancing eyes are a nod to Lenci dolls, one of my favorite doll companies of this era. Love the blog? Want to help out? Try donating through Patreon, liking the facebook page and/or leaving a comment. One thing that super annoys me is when child dolls don’t get dressed like children. So, when it came to designing a New Years party dress for the Poppets printable paper dolls, I wanted to draw a holiday sort of child’s party dress. I think if you recolored this gown, it could also be a Easter dress or a Thanksgiving dress or any number of other things. So, check out the black and white version if you want to try your hand and setting the Poppets up for another holiday. You know what sort of amazes me? 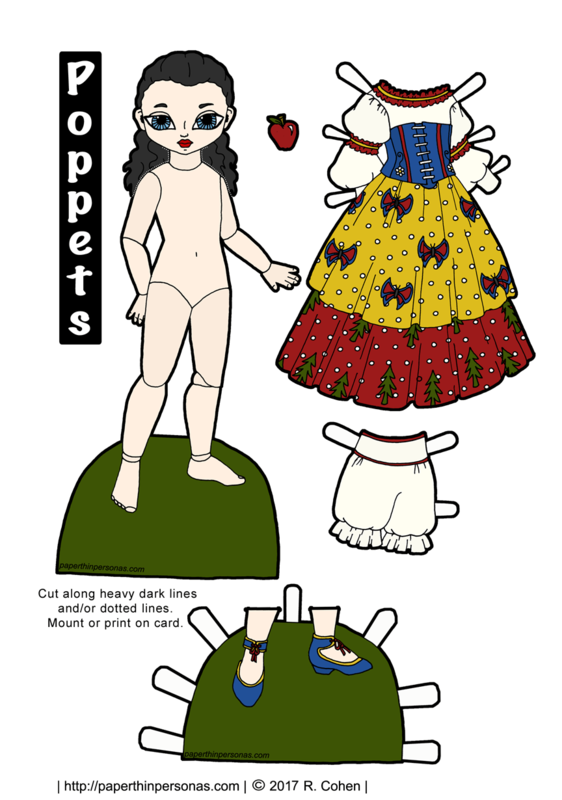 So, all of last year I posted 10 Poppets paper doll posts. This year I posted 18. That’s a lot more. Now, it is not a perfect comparison, because I stopped posting “sets” and started posting individual outfits, but still. Pretty notable increase I think. And I can’t wait to keep posting for them. I have a bunch of 1920s stuff drawn and I want to do a fairy tale series for them as well. So if you are a Poppet paper doll fan, stay tuned for next year. What would you like to see for the Poppets in the coming year? Drop me a comment if you have an idea. Meanwhile, if you want to support the blog in 2017, then think about becoming a Patron. Once in a while, a paper doll face comes out just as I imagined it. And this is one of those paper dolls. I think she’s very cute and I couldn’t be more pleased with how she turned out. I was a little scared to draw a paper doll with natural hair, so I hope she looks okay. 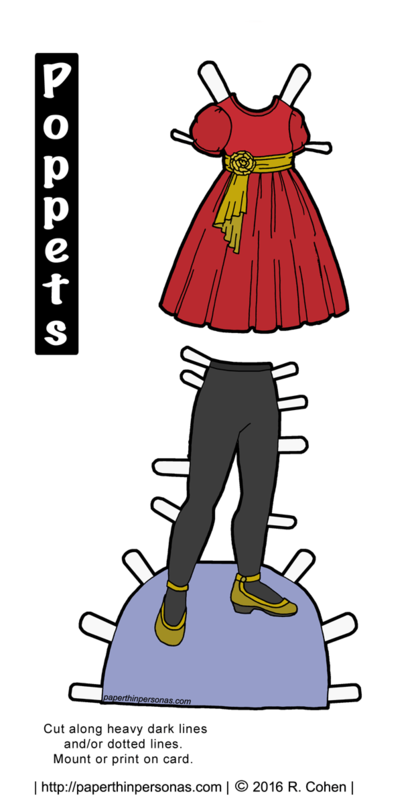 As with my last Poppet paper doll, I didn’t name her, but feel free to do so yourself. She has the same skin-tone as Petal, so they can share shoes. I indicated that by making the paper dolls bases the same color. 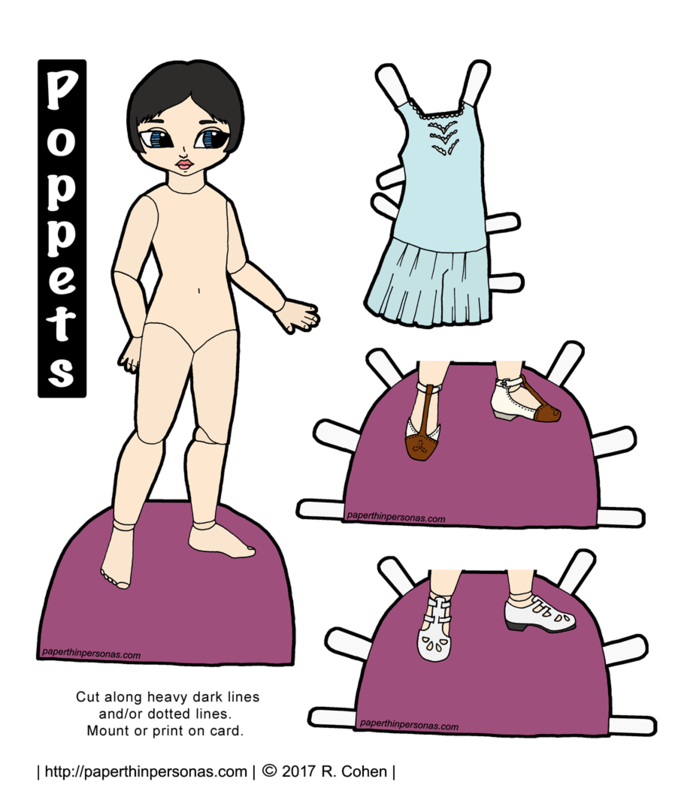 The Poppets paper doll body design was based on by Ball Jointed Dolls (BJDs) sold by companies like Volks, Iplehouse and Fairyland. While BDJs are beautiful, they can be super expensive. Plus, as they are made of resin, they can’t be in direct light and have to be handled while wearing gloves. I just can’t imagine owning a doll that I was scared to touch. One of the best parts of printable paper dolls is that if one gets damaged, it is not big deal. Just print another one. There’s no specific BJD that inspired today’s brown skinned Poppet paper doll, but I like to mention the original inspiration for the Poppets when I can. I don’t think of the Poppets as “real” children, but rather dolls. I loved paper dolls of dolls when I was a child, especially the ones by Peck-Grande like this one from Ebay. Want to know when new things post? Then follow the blog on Twitter @paperpersonas. I post every time something new pops up. I was what the best option for knowing when new stuff arrives is and I think this is it. There is also an email list (sign up in the sidebar) and that will email you, so that is an option too. If you want to help keep the blog up and running then think about donating and becoming a Patron.